GOT FILE ENVY? HUBDRIVE VS CONTENT DISTRIBUTION: WHICH IS RIGHT FOR YOU? Let's face it. File envy is a terrible way to work. Everyone wants to be absolutely sure that they have access to, and are working with, the very latest version of content. But with so many drives and devices, whether located across various departments, external renderers, or Hub and Spoke CAMIO systems, it can be difficult to know - really know - that you do indeed have the latest version of content. Media management across large news and sports content creation and distribution organizations is at best a complex and time-consuming effort. That's where ChyronHego's new HubDrive content distribution and syncing application comes into play. 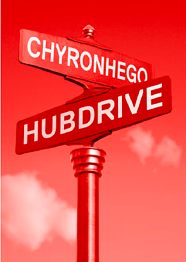 HubDrive is ChyronHego’s new Dropbox™-style folder synchronization solution. Available in Standalone or CAMIO configuration, HubDrive is based on folder contents being pushed to and pulled from a central server by subscribed client devices. These "devices", like those referenced above, include art department PCs, playout devices, external renderers, MediaMakers, and spoke CAMIOs in a Hub and Spoke environment. HubDrive expands that user-base to also include external hard drives and Remote Trucks/OB Vans. While HubDrive is a brand new solution designed to make the distribution and syncing of content a quick and easy proposition, ChyronHego has for some time also offered our customers another aptly named solution, Content Distribution. Content Distribution is a file replication solution, most widely used with PRIME Graphics and Channel Box systems. Content Distribution offers the user a high degree of control over when and how often content is synced utilizing user management and group management workflows. 1. HubDrive is meant to run continuously like Dropbox, syncing immediately when changes happen. 2. HubDrive is best for CAMIO applications due to integration with Contexts and CAMIO’s Asset Manager. 3. HubDrive is best for Truck/OB Vans due to the fact that version metadata is kept with the folder, so you can move a folder between hard drives, then resync, and HubDrive will only update the delta of changes. 1. Content Distribution offers the user a more fine-tuned control of syncing, such as scheduling by time of day or frequency, and separation of download, deploy, and purge. 2. Before or after any of the three stages of Content Distribution (Download, Deploy or Purge) scripts, batch files or an executable can be triggered. 3. Content Distribution is best for PRIME Graphics or Channel Box applications due to Content Distribution Manager’s native integration with those applications. There are of course other considerations, and you can read about those and more in our new white paper, Comparing ChyronHego’s HubDrive and Content Distribution Solutions. Click the image below to get started, then contact your ChyronHego salesperson to help you determine whether HubDrive or Content Distribution is right for you.